FREE Sinkhole Repair, Monitoring & Engineering!!!!! Sinkholes occur when collapsing of the underground limestone layers happen, allowing the soils above to erode into the voids below leaving behind a hole. Sinkholes are a natural occurrence in nature, but can also be a result of human activity when the landscape changes as we build homes. Foundation Masters, LLC receives about 20-30 sinkhole calls a week. The majority of calls are not sinkhole related, buried trash, debris, organics and broken mechanical lines are usually to blame. However all Sinkholes are dangerous and should be treated with caution. 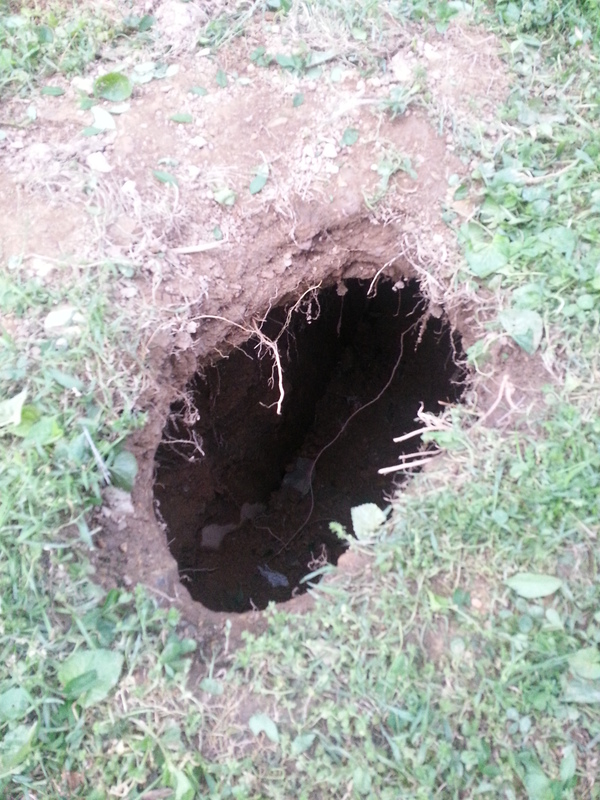 Sinkholes come in all shapes and sizes, causing dangerous conditions in your backyard. Because of these dangers, sinkholes should be rep[aired as soon as you notice them. It is very important you contact a professional engineer can handle this repair. Foundation Masters, LLC is looking for active sinkholes to study, if you have a active sinkhole or a hole opened up in your yard please fill out the contact form and someone will get back to you.